Business leaders in Malaysia are showing urgency in embracing the 4th Industrial Revolution, where 80% of them believe that they need to transform to a digital business to enable future growth. 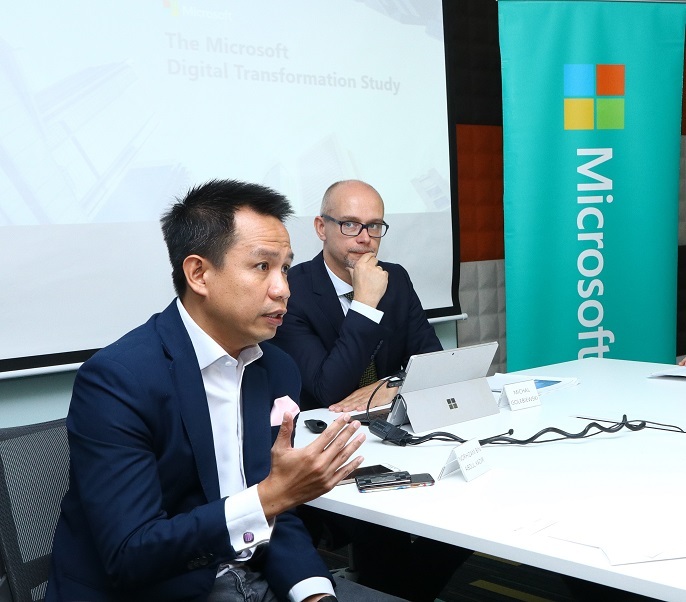 These are some of the key findings of the Microsoft Asia Digital Transformation Survey to understand how business leaders are embracing the digital era. Even as majority of business leaders are aware of the urgent need to transform digitally to address the changing business climate, the study found that the transformation journey for most organisations in Malaysia is still at its infancy. While, only 34% of business leaders have a full digital transformation strategy and less than half (47%) are in progress with specific digital transformation initiatives for selected parts of their business. 19% still have very limited or no strategy in place. “It was interesting to learn that 88% of business leaders felt that new data insights would lead to new revenue streams. And yet, it is concerning to see that while there is widespread acknowledgement on the need to transform, they are doing so incrementally. With constant pressure from newer, agile and tech savvy players disrupting across industries in Asia, the transformation of products and new revenue models provides the greatest opportunity for organisations to truly lead rather than be disrupted. Leaders need to rethink business models, find new data insights which lead to new revenue streams,” he added. Technology advancements have ushered in the 4th Industrial Revolution, where cutting-edge technologies such as Internet of Things (IoT), artificial intelligence (AI), advanced data analytics, and mixed reality are powered by cloud computing to create limitless possibilities in transforming the way people work, live and play. This revolution, together with rapid urbanization, emergence of the millennial workforce and a fragile global economic climate, is ushering societal and economic changes at an unprecedented pace. According to the respondents in Malaysia, the most relevant emerging technology to an organisation’s digital transformation efforts is Artificial Intelligence (75%) and least is wearable technologies (57%). The Microsoft Asia Digital Transformation Study surveyed 1,494 business leaders from Asia, including 113 from Malaysia. All respondents were pre-qualified as being involved in shaping their organizations’ digital strategy. To find out more about how Microsoft is enabling digital transformation for organisations, visit enterprise.microsoft.com.